We want to be honest with you. We love Macs. We believe that they’re excellent machines and they have one of the most sophisticated and most user-friendly operating systems around… so please don’t take this article as a technical writer’s view concerning a Mac or PC OS alternative, but as an enthusiast’s opinion about a nice relationship. Apple, meet the PC! 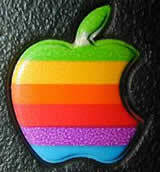 Apple is known for its technical excellence in all the products that sells in the market. You won’t have to worry if the motherboard has a short circuit with the chassis of the computer because of a missing screw, nor about the white noise that the computer of yours produces by its 10 ultra fast air-blowers. On the contrary, you will have to worry about the amount of money you will have to pay in order to have one of those lovely Apple Macs on your desk. -“OK, so is there a way to run OSX on a computer without paying this whole lot?”. I hear you saying? Well, actually there are a couple of ways, yes. The first one is to visit some online auction store and seek for the item you wish to buy for less the money. The other one is much more exciting and demands some effort from your part. 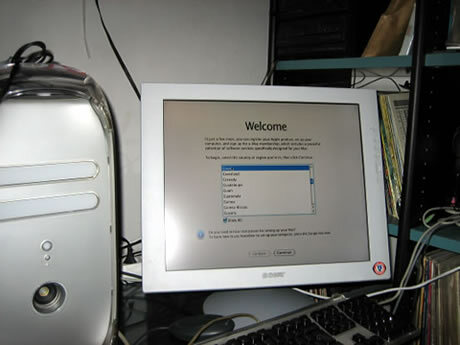 If you check the technical details about the components that a brand new Apple Mac (“Mac Intel”) has, you will notice that it’s pretty much what most computer technicians use to call plain PCs. These machines are able to run Windows, Linux and of course OSX pretty good, with the use of one single program. 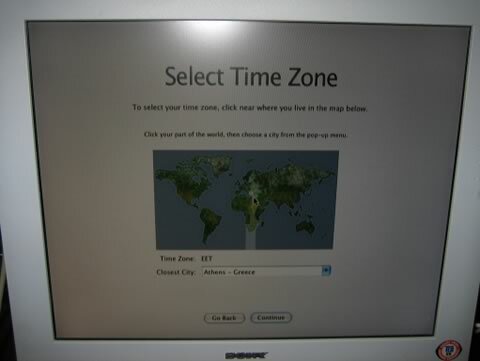 Boot camp is a utility that Apple ships with its machines in order the final user to have the ability to run all these operating systems on his/her brand new Mac; but could this be reversed? I mean, could it be possible to have a software utility that is able to run OSX on a non Mac machine? Apparently, there is! 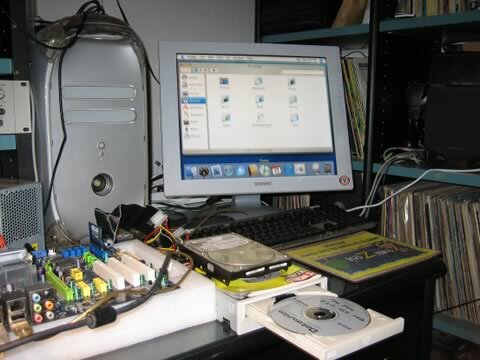 The only trick is that you will have to get yourself a perfectly compatible hardware so that you’ll manage to fool OSX installation DVD that your PC is actually a Mac! Yes, you can do so pretty easily, by just purchasing a PC that contains the very same parts a simple Mac does! Ah, there’s another issue. 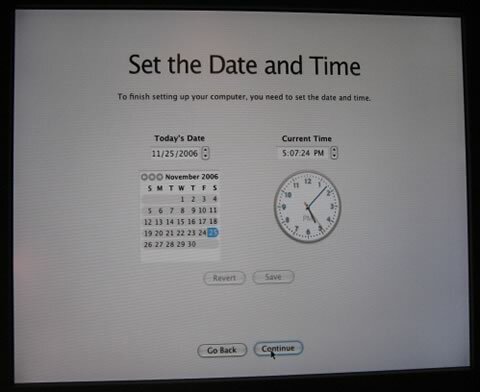 A true Mac doesn’t contain an ordinary PC BIOS. 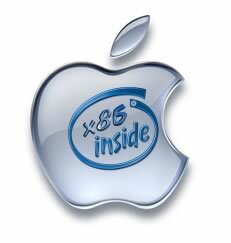 is a codename that describes the effort of mankind to run OSX on a x86 machine. Yes, that’s right, ANY machine that fulfills the term “PC compatible”. You don’t have to have an Intel CPU, or a specific hardware list that matches a Macintosh to run OSX, but if you do, then you will have fewer things to worry about. Let’s be more specific. 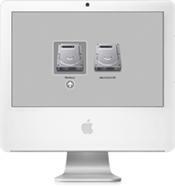 In order to build a perfect Mac alternative the components you are going to need must be in a compatibility list. Whether you like it or not, it’s not an easy task to fool a computer nowadays. Many people have contributed into this list and if you want to have a good start you better pay good attention here. OS86 project has got a lot of experience on the matter and we strongly advise you to pick up your hardware according to their compatibility lists; it will save you time and money (and a lot of posting in the forums). As you can see the cost has reached a total of 665 euros. We must state here that we had several hardware components lying around and if this is not your case, then you may reconsider on buying a new Mac instead of building a clone machine. If you want to drop the cost you should go for a smaller CPU or less RAM. What’s a giant without a brain? What’s a man without a soul? What’s a computer without software? You got the point; you need the Operating System too! From this moment on we must inform you that you will have to search for the software on your own. We will not answer to emails concerning where we found the software nor we assist you where to find it. It’s not legal to obtain pirated software and it’s not recommended in any case from our position either. 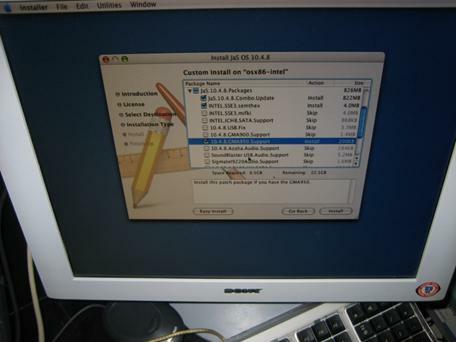 We found the software by applying a ppf patch that we found on the net over an ORIGINAL 10.4.8 OSX Tiger ISO we created from our newly purchased iMac Intel Core 2 Duo. 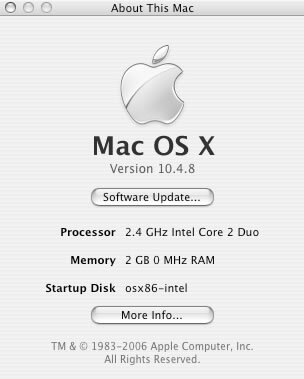 The new ISO contains the JAS 10.4.8 OS software that we used to install OSX into our Mac clone. It’s not 100% legal, but I guess you can do the same and feel good about it, since the Apple Software Engineers finally will get their part of money for their efforts on producing such a great Operating System. Yes. That’s our idea of a perfect lab machine! Who needs screws? Who needs floppy? Who needs a chassis? Just plain power over the table! From left to right: The 6600 Intel CPU with the Intel official blower (you’ll get to hate the plastic screw mounting system by the way – they break awfully easy!) Down, beside the LPT port the USB generic sound device – just 13 euros off the shelf at Stournari St. Athens. Rocks! Up above the CPU: 2GB of OCZ mem. The Foxconn mobo is laying on a plastic X800 GT pack-case and right beside it you can see the IBM Deskstar (30GB) laying over the Toshiba DVD ROM (right below the PC World Secrets leaflet – makes perfect isolation between the electronic parts of the HDD and the top of the DVD ROM metallic case). 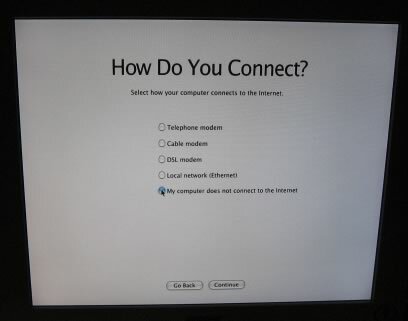 After that, several other screens follow that ask you to choose your network connection etc. Just go through them. Which means 2,147,483,647 seconds after UNIX’s birthday corresponds to GMT 03:14:07, Tuesday, January 19, 2038. One second later, many UNIX systems (yes including your beloved OSX) will revert to their starting date, which is (yes) January 1, 1970. You can read more about this bug on the official Project 2038 bug FAQ. So, we did find a bug after all in the OSX system! Big deal! We probably won’t have to worry about it since the computer technology will be so advanced after 32 years that there will be no problem at all! Right? Wrong! A moral issue here is to see how the world is moving. Within a few days you’ll be asking yourselves if you are going to buy Windows™ Vista or not. Vista is a very nice looking OS and we think that it’s going to be a successful rival to its predecessor Windows™ XP; but there is a problem; for the first time in computer history, the OS fails to fulfil the demands of the hardware! Note that for all tests we used two processors. 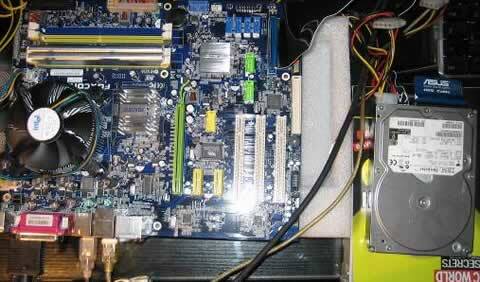 Intel XE6800 and Intel QX6700. Both processors come with unlocked multiplier, that means we can "emulate" the performance of the missing processors (aka E6600, E6700, QX6600 and QX6800). CINEBENCH is the free benchmarking tool for Windows and Mac OSX based on the powerful 3D software CINEMA 4D. Consequently, the results of tests conducted using CINEBENCH 9.5 carry significant weight when analyzing a computer’s performance in everyday use. Maxon's Cinebench has been a good benchmark measuring Quad core under Windows. Higher numbers, indicating faster processing rates, are better. Rendering (x CPU): same test but using multiple processors where available. C4D Shading: Uses Cinema 4D software to render huge numbers of polygons. CineBench is one of the few benchmarks that support multi-core. 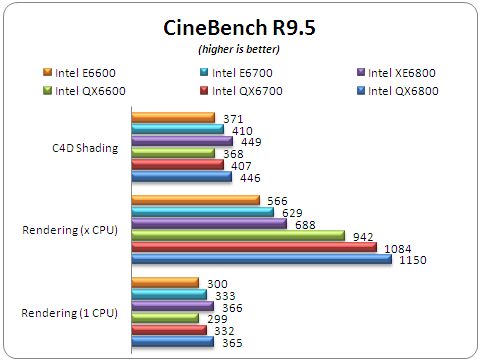 As was expected Intel QX6800 rated at 2.93GHz outperforms all processors, at least at the "Rendering (x CPU)" test. In other cases, Intel XE6800 is faster, even by a small margin. Geekbench is a new benchmarking program that tests memory and CPU performance with single and multi-core processors support. 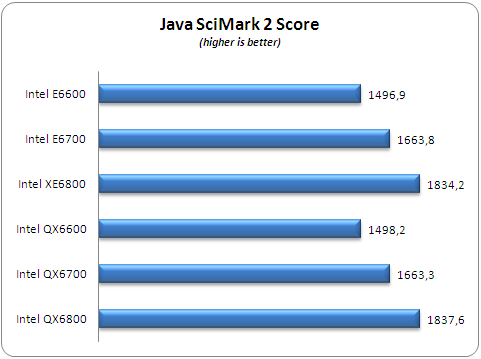 The software reports many numbers and for our comparison we will get the "index" score. As was expected Quad Core CPUs are faster than Dual core. You can view the analytic test results for each processor E6600, E6700, XE6800, QX6600, QX6700, QX6800. 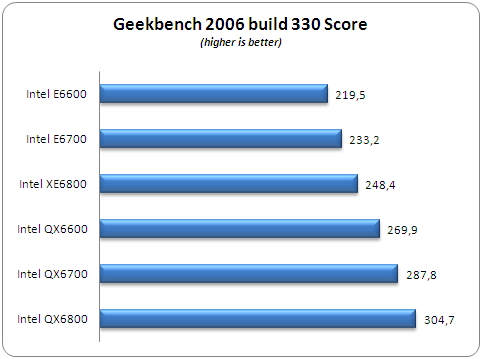 Xbench has been the standard for Mac benchmarking in recent years. This shareware application is easy to run and produces detailed results for many different performance parameters, as well as some helpful information about the test configuration. Xbench results are a bit tricky, since varies widely from run to run and can be overly sensitive to small configuration details. 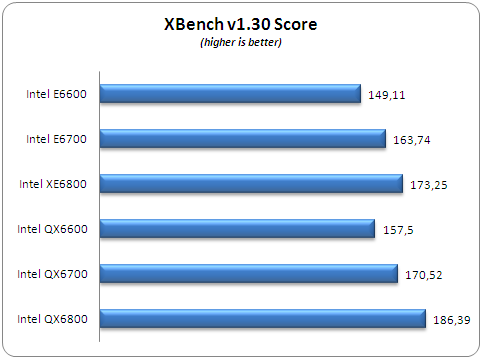 XBench v1.3 seems to affected by Quad Core processors and produced highier ranking scores for all QX series. Java SciMark 2 has been developed by NIST. 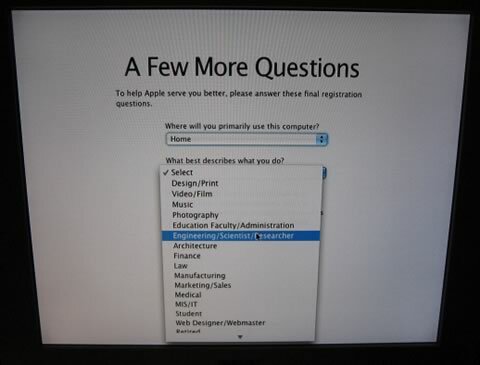 The procedure we used to have the exactly same results at all tests was to open a terminal application and then type: appletviewer http://math.nist.gov/scimark2/run.html. At the end of the test you can see all six result numbers. Results are shown in Mflops (Millions of floating point operations per second), so higher numbers are better than lower ones. We sum all produced test results for an overall score. SciMark 2.0 doesn't use Quad core and test results shows it clearly. applications must be written with libraries supporting multi-core processors. Of course apart from what all synthetic benchmarks showed, our general impression was that MacOSX was faster with Core2Duo processors, we hope the upcoming MacOSX 10.5 to have better support for multi-core systems.